Four more author assemblies brought a close to a really busy half term. 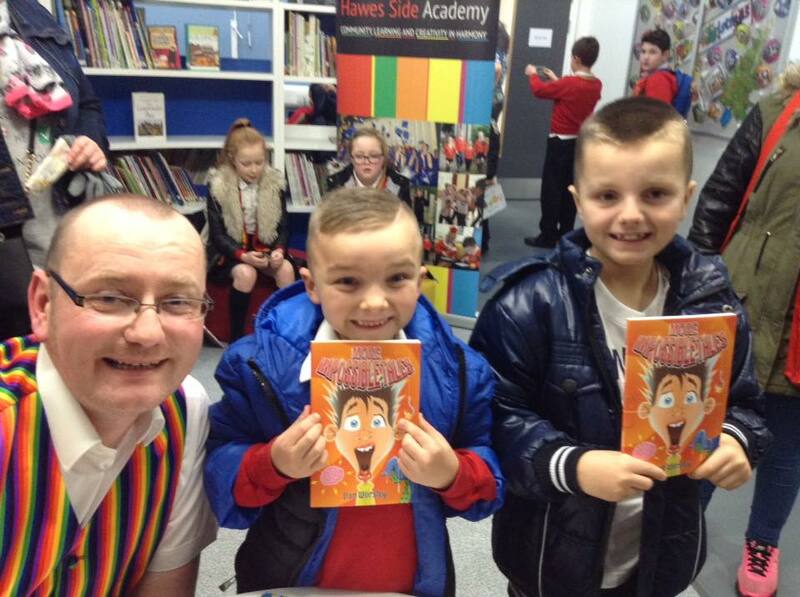 I’d visited Hawes Side Academy, Blackpool, many times and it’s always a joy. The pupils and staff are fantastic and make me feel so welcome. Combine that with the fact they had just moved into a new school with a brand new library and I couldn’t wait to visit! After visiting earlier in the week to share More Impossible Tales during an author assembly with over 350 KS2 pupils, I returned to open the new library and sign some books. It was an honour to cut the ribbon and say a few words. I seem to hear lots about libraries closing, which is heartbreaking, so it was lovely to see a new one open. Thanks go to Mrs Coolican for organising the visit and promoting it so effectively. It had been nearly eighteen months since I’d visited Lytham Hall Park Primary, so I had a lot to tell the children in the author assembly. The pupils listened attentively as I introduced them to Eric and his adventure before I shared one of the stories from the new Impossible Tales. It’s a particularly horrible story and features some stomach-churning events! I really enjoyed my time at Lytham Hall Park Primary and it was lovely to return later in the week for a book signing. I’m thrilled to announce that I’ll return in January 2017 as part of the celebrations to mark the opening of the new library. Thanks go to Miss Ainsworth for organising the event. Manor Beach Primary in Cleveleys is a lovely place and one that I always enjoy visiting. I was thrilled when the school invited me back to share More Impossible Tales. The children listened so well as I talked them through the writing and illustrative process, before I put on the storytelling waistcoat to share one of the new Tales. After the assembly, I spent time visiting each of the Key Stage 2 classes where I signed books and answered lots of questions. Some of the children’s questions really made me think! I’d like to thank Miss Davies for inviting me in and can’t wait to return in 2017 with Eric 2. The final school event of 2017 took place at St John’s CE Primary in Blackpool. The children at St John’s have been part of my writing adventure from the start and I first visited in 2014 with the original Impossible Tales. You could have heard a pin drop as I talked the pupils through the new book. The groans and gasps during the storytelling session told me they were really using their imaginations to picture the stomach-churning events. I had a great time and it was the perfect way to close the school events for the year. Thanks go to Mrs Galloway for setting up the visit.